Teddy. Two years ago, I loved reading Kate Atkinson’s novel Life After Life in which protagonist Ursula Todd died in every chapter. Atkinson now presents a novel titled, A God in Ruins, with Ursula’s brother, Teddy, as protagonist. Teddy was an RAF bomber in World War II, and Atkinson’s prose about war is among the best I’ve read. War confounds reason as we destroy much of what we are trying to save and defend. She takes apart Teddy and members of his family to examine him from many time periods and perspectives, in every setting drawing a complete picture of ordinary life. I highly recommend this finely written novel that is one of the best I’ve read this year. 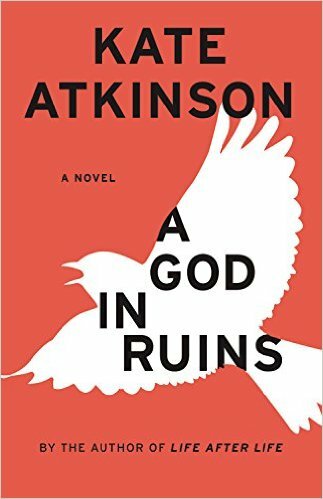 Rating: Five-star (I love it) Click here to purchase A God in Ruins from amazon.com. Writers. Long summer days are an ideal time to relax with a Stephen King story. I zipped through King’s novel titled, Finders Keepers, in two lazy afternoons, and was delighted by the characters, plot and dialogue. 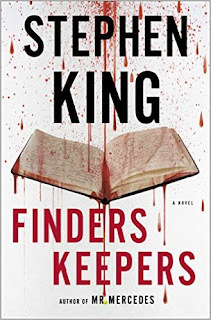 The bonus for King fans is the reprisal of characters from last summer’s novel, Mr. Mercedes. What made me like this summer’s novel even more was the plot about writers and an obsessed reader. I think King is among our finest contemporary storytellers, and this novel entertained me thoroughly. Rating: Five-star (I love it) Click here to purchase Finders Keepers from amazon.com. Candid. One of the liveliest non-fiction books I’ve read this year is Henry Marsh’s Do No Harm: Stories of Life, Death and Brain Surgery. 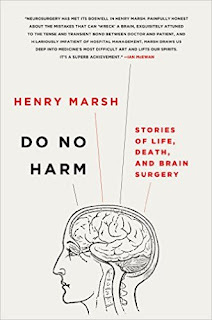 Marsh is a neurosurgeon in England, and he uses this book to draw readers into the stories of patients, his work as a brain surgeon, and the life and death consequences of his work. I was impressed by the candid way in which he admits to mistakes. His fights with managers and bureaucracy are often humorous. Most of all this is a delightful exploration of our human life in all its wonder. I was delighted from beginning to end. Rating: Four-star (I like it) Click here to purchase Do No Harm from amazon.com. Torch. There are so many political books to consider reading that I was reluctant to pick up Gary Hart’s The Republic of Conscience. A very long time ago during a different presidential campaign season, I had dismissed the Gary Hart of the Monkey Business scandal and paid no attention to him since. I’m glad that I selected this book which provides advice both cogent and wise. 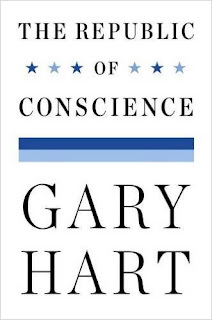 Hart offers a perspective on moral authority, and the principles on which the United States was formed. This book is a plea for citizens to pick up the torch of our founders, and return this country to the republic is was formed to become. 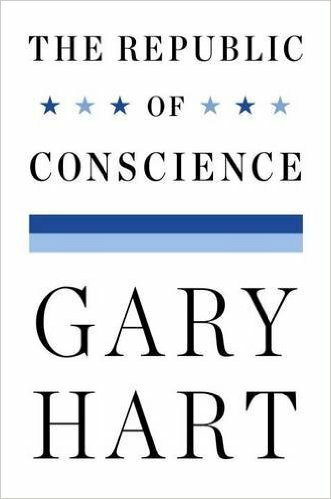 Some readers may be distracted by occasional partisan swipes, but most readers will find Hart’s assessment of our current situation rings true, and his prescription for a return to fundamental principles as a wise approach to pursue. If nothing else, time spent reading this book can tune out the current political clown shows and focus on something more important. Rating: Four-star (I like it) Click here to purchase The Republic of Conscience from amazon.com. Unedited. 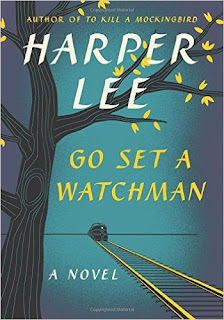 I read Harper Lee’s novel, Go Set a Watchman, on the day of its release. Given all the publicity about this book, I was curious and wanted to read for myself whether it was as finely written as To Kill a Mockingbird. It is not. I found myself thinking often as I read the narrative that the text lacked the benefits that come from the expert work of a talented editor. While there are some interesting themes of blindness, paternalism and maturity, none of them satisfied me. The prose was didactic, and the dialogue weak. While the reprised characters in this novel are more complex than in the earlier novel, they are also more ordinary and less heroic. A wise editor would have steered the author toward finer prose, improved dialogue, and a better plot. Perhaps that’s exactly what happened decades ago. Sate your curiosity if you wish, but there are many finer books to read, and I can’t recommend this one. Rating: Two-star (I didn’t like it) Click here to purchase Go Set a Watchman from amazon.com. Trail. Reading a novel by Paul Doiron featuring Maine game warden Mike Bowditch is almost as much fun as being in Maine. Most of the action in The Precipice takes place along the Appalachian Trail, and there are coyotes, hikers and a great cast of interesting characters. Readers who enjoy action thrillers, especially those set in the great outdoors, are likely to enjoy this novel and this series. 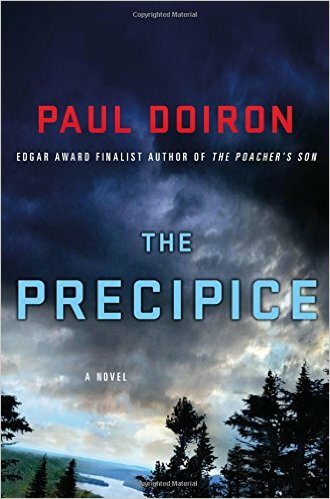 Rating: Four-star (I like it) Click here to purchase The Precipice from amazon.com. Revenge. One of the challenges for writers of character-based thrillers is keeping the character consistent while developing that character in new and interesting ways. 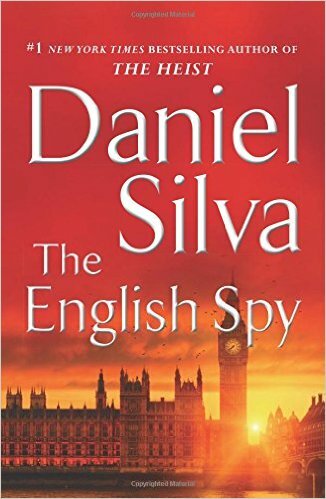 Daniel Silva’s protagonist, Gabriel Allon, the art restorer and Israeli spy, is a complicated and well-developed character. 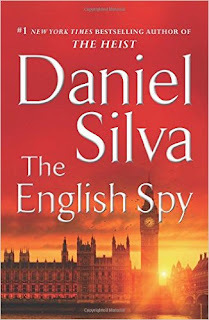 In The English Spy, Silva adds to Allon’s personal story as he and Chiara are about to have a child. In his profession, Allon is coming closer to taking over The Office. The plot of this novel takes Allon to the field in many countries as he has the opportunity to exact revenge on a foe, while Chiara’s due date draws near. As with all the novels in this series, there’s lots of violence, the action moves quickly, and the excitement is always entertaining. Rating: Four-star (I like it) Click here to purchase The English Spy from amazon.com. Goodness. 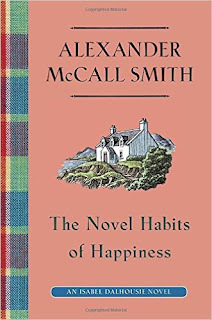 Every time I complete the last page of a novel by Alexander McCall Smith, I notice that I have good feelings about humanity. 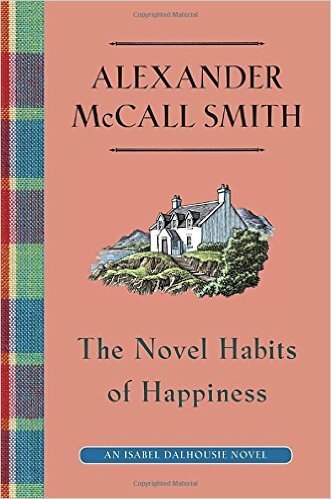 The latest novel in his series featuring protagonist and philosopher Isabel Dalhousie is titled, The Novel Habits of Happiness. Fans of the series will enjoy the updated relationships among a familiar cast of characters, along with some unexpected twists. Isabel is asked to help a woman who is troubled by things that her young son has been saying. While Isabel hesitates to assist this woman, her kindness and goodness leads her to do what she can to help. That theme of goodness provides the opportunity for Smith to develop these characters and reflect on what brings us happiness. Any reader who wants to read a novel to feel good should consider reading this one. Rating: Four-star (I like it) Click here to purchase The Novel Habits of Happiness from amazon.com. Remnant. There are so many reasons not to read Neal Stephenson’s novel, Seveneves. After all, who has time to read a novel that comes in at almost nine hundred pages? And did you know it could be categorized as science fiction? Isn’t that genre for adolescents and weirdos? And why bother with yet another novel that destroys the world as we know it? Forget all those reasons and others you may have, and give this finely written book some attention. Stephenson uses these 900 pages well to explore the essence of our humanity. He presents the relationship between politics and science with clarity. He sets up a catastrophe that threatens human survival, lets it happen, allows a remnant to survive, and then projects how that remnant builds a new society. Stephenson explores big ideas, and it takes a big book to do that well. I hesitate to say that I enjoyed this novel so much I wish it were even longer. Rating: Five-star (I love it) Click here to purchase Seveneves from amazon.com. Friendship. Kent Haruf was an American writer who used his fine writing skills to reveal the deep and abiding goodness in our human nature. The last book he wrote is titled, Our Souls at Night, and I highly recommend it to any reader who wants to feel good after reading a book. Protagonists Addie Moore and Louis Waters had been neighbors, and not quite friends. Their respective spouses had died and each now lives alone. Haruf draws them together through all the best elements of a talented writer: finely written descriptive language, realistic dialogue and the revelation of human behavior in all its complexity and wonder. Through talk and touch, a friendship develops between Addie and Louis that will delight any reader. Rating: Five-star (I love it) Click here to purchase Our Souls at Night from amazon.com. Alsops. Readers with an interest in the three decades from the end of World War II through Watergate and in the policies and politics of the United States will find a lot to enjoy from reading a book by Gregg Herken titled, The Georgetown Set: Friends and Rivals in Cold War Washington. Herken takes readers to the neighborhood of Georgetown in Washington, D.C., and presents a cast of characters who lived in that neighborhood and formed or influenced major public policies. While there are lots of characters presented, it seemed to me that two individuals dominated the narrative: journalists Joseph and Stewart Alsop. Political junkies and those interested in Washington, D.C. are the readers most likely to enjoy this book. Rating: Four-star (I like it) Click here to purchase The Georgetown Set from amazon.com. Pacing. The characters and pacing of Joseph Finder’s novel, The Fixer, provide readers with ideal ingredients for an entertaining thriller. Summer can be a great time to read a thriller, either while traveling or on those lazy vacation afternoons. Protagonist Rick Hoffman loses his job and his girlfriend and gains a hoard of cash and the enmity of those who want past secrets to remain undisturbed. Finder offers great pacing, interesting characters and a plot that kept me turning the pages. Readers who like thrillers should find something to like in this one. Rating: Four-star (I like it) Click here to purchase The Fixer from amazon.com. Dependence. The Revolutionary War united the states briefly and a wide range of outcomes could have followed the end of fighting. Historian Joseph J. Ellis narrows in on the period from 1783 to 1789 in his book titled, The Quartet: Orchestrating the Second American Revolution, 1783-1789. Ellis describes the ways in which four individuals, George Washington, Alexander Hamilton, John Jay and James Madison, nudged others toward the creation of the United States. The story of independence led to an opportunity for dependence of each state on others and on a central federal government. Ellis writes to please any general reader, and I found this book interesting from beginning to end. Rating: Four-star (I like it) Click here to purchase The Quartet from amazon.com. Languid. The lazy days of summer are an ideal time to read the latest Mary Russell and Sherlock Holmes by Laurie King titled, Dreaming Spies. Readers looking for a fast-paced thriller should search elsewhere. Russell and Holmes find themselves on a long journey by ship, walking across Japan to meet a client, and searching the Bodleian at Oxford. There are haiku to read and think about, and I found myself slowing down as I read this novel. If a languid novel is in your summer plans, consider reading this one. Rating: Four-star (I like it) Click here to purchase Dreaming Spies from amazon.com. Hollywood. I enjoyed reading a witty debut novel by Christopher Noxon titled Plus One. Set in Hollywood, Noxon draws readers into a marriage with kids, and all the dynamics that can bring, kicked up several notches. Figgy has become a successful TV writer, so her husband, Alex, takes care of the home and the kids, except when he doesn’t. Any reader who has watched the red carpet and noted the invisibility of “nobody” spouses will get the Alex character. Every female reader will get the Figgy character. Readers looking for a light and witty novel that still captures real marital relationships should consider reading this book. Rating: Four-star (I like it) Click here to purchase Plus One from amazon.com.